Who don’t like chocolate? It attracted kings and queens of old. It was food of the rich. Today it is available to everyone. I am not talking about American milk chocolate which is mostly milk, sugar and fat with a little coco. Real chocolate is what we call dark chocolate. It’s not overly sweet but creamy. Put a small piece on your tongue and let your body heat melt it slowly. Feel the velvety smooth chocolate run down your tongue. Finally taste the chocolate. YUM! Chocolate in Perugia, Italy is real chocolate! It is where the world-famous Perugina chocolates come from. 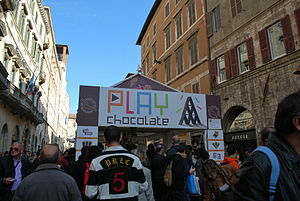 Italy hosts a chocolate festival called Eurochocolate. Unfortunately it ended yesterday but there is always next year. Plan your trip early. Perugia is the capital city of the region of Umbria, Italy. Reblogged this on Holiday Rent Club to Italy.